You know those annoying political junk mailers and TV ads you get in the mail every few years? Ever wonder how they get produced? Well, if you’re living in San Francisco, you’re getting a front row seat to the madness, courtesy of Supervisor Scott Wiener. 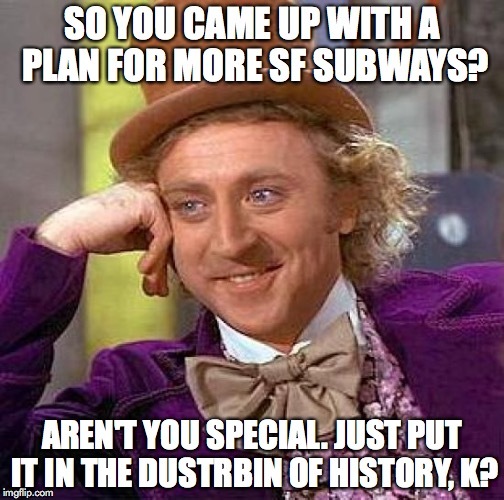 On Monday, readers of Medium were treated to Scott’s grandiose “Plan” for “Building Subways” all over San Francsico. Normally these “thinkpieces” (doublespeak for boring thing written online) on Medium only get read by nerds with iPhones, but this one was widely distributed. Soon the Examiner was heaping all manner of praise on Wiener, and “transit advocates” couldn’t wait to scream “Mayor Wiener!” and other assorted cheers, hallelujiahs, and whatnos, in Praise of Super Scott. After all, yay subways, right? Big talk from politicians is nothing new, and little in Super Scott’s Big Plan is more of the same. Sure, there “should” be a “westside subway” – you read about it here, five years ago, based on plans from the 1960s. Likewise, the Geary tunnel should have been built ages ago, for one of the busiest transit lines west of the Mississippi, but we can’t even build a stupid BRT on time. Want more? Go check out Eric Fisher’s Flickr Account, where you can read about a “Rapid Transit Plan” from the early 1970s, and all the discarded plans for a “real” BART system that would Actually Serve All of the Bay Area. Don’t forget – we also tore down the Key System (which ran on the Bay Bridge!) and killed Muni’s line to San Mateo (you read that right), because, um, well it seemed like a good idea at the time? Still not enough “plans” for you? Then go check out another pie-in-the-sky plan, this from the guy who brought you the iTunes user experience, and is now running for mayor (!). Want more? Peruse the blog archives, or your local library. There are plenty of them, all made with the best of intentions. Unfortunately, “good intentions” never made anything, here or anywhere. It is very easy for anyone to sit down, look at a map, and start drawing fantasy maps of what should be. It is also very easy to have the benefit of hindsight in 2015 and look back and wonder why it is a better BART, a better regional transit agency, better allocation of housing all around the Greater Bay Area, better highways, more bikes, solar paneled geodesic domes, aren’t all a part of The Now. It is a lot more difficult to build the political will to build something truly visionary, and put in the long, hard hours behind the scenes to make it happen, something one might not even see completed in their lifetime. It also doesn’t fit in an 11 x 17 mail piece, nor does it sound good on a TV ad. It is even more difficult to go to the moneyed interests backing one’s (endless) campaigns, and tell them they’re going to have to pony up the many dollars to make all this happen. It is even more difficult for a San Francisco politician to marshall all this regionally when a) they don’t even represent all of San Francisco, and b) are spending a lot of their time in their current job trying to get one in Sacramento. It is even more difficult given how local and state leaders in the Greater Bay Area can’t agree on much to begin with (and wow they love sticking it to San Francisco). Building a Big Subway, however, is not the point. Instead, this whole exercise is less about the viability of vague proposals posted to Medium, and instead about generating good press to put in junk mailers, TV ads and God Knows What Else online, in support of a middling politician’s bid for another job. Endless talk fuels such efforts, and lost in the talking is the very real fact that we’ve already had “talk” for over 100 years with regards to regional transportation, and in the process we’ve voted for so many people based on those junk mailers. Meanwhile, the status quo remains, and the talk is forgotten. The maps and flyers and talk do make for a good Tumblr/flickr/storify/etc. Just don’t be surprised when you elect Dear Scott to the State Senate, his big plan that earned so much praise without question, falls by the wayside. I won’t. PS: Scott Wiener was re-elected in 2014, and already he’s angling for another job, while collecting a salary from the City of San Francisco. If he really didn’t want to stay in office, why did he run for re-election? Why raise and spend all that money to get a job he clearly doesn’t want anymore? Maybe we should change the law so that when someone wants to run for another gig, they have to quit the one they have. Not sure how that would work, or if it’s even legal, but surely some Legal Geniuses out there can figure this one out one way or the other, yes? This entry was posted in Local History, MUNI/SFMTA, News & Politics, Uncategorized and tagged bart, bayarea, budget, edleesucks, innersunset, muni, politics, san francisco, scottwiener, sfcta, sfmta, showboating, statesenator, stupidvisors, supervisors, wtaf, wtf. Bookmark the permalink. 2 Responses to Press, Advocates, Lose It for Scott Weiner Junk Mailer In Progress!